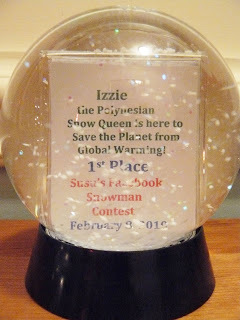 >Izzie the Polynesian Snow Queen and Frosty’s Date take 1st and 2nd Prizes! >”Lulu” here. Yes, it’s Jimmy Buffett’s sister. When I’m not busy welcoming guests to my bar and restaurant down in Gulf Shores, Alabama, I like to hang out with my friend, SuSu, on her patio in Memphis. Especially for Happy Hour. 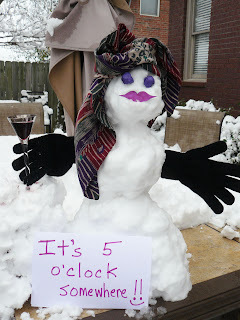 Like Jimmy always says, “It’s 5 o’clock somewhere!” But on with the results of SuSu’s Snowman Contest! Knowing how Mary Elise and Caroline feel about the environment, I recognized the subliminal message they are sending to all Americans through Izzie’s wardrobe. 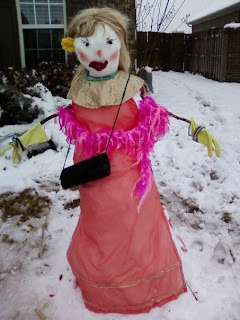 Izzie is a woman who is ready for GLOBAL WARMING. Therefore, I am proud to present Team Manning-O’Brien with this Snow Globe containing a photo of Izzie on one side, and their 1st Place Certificate on the other side! Congrats, girls! 2nd Place goes to Veronica and Janine Criswell for their extremely creative work: “Frosty’s Date.” Janine drew on her experience as a folklorist and in theater for her design, and I’m sure Veronica’s standing as a teenager was also significant to the work. The inscription on their 2nd Place Certificate reads: “For Excellence in Theatrical Pose, Costuming, Hair & Make Up.” I especially like the eye lashes and boa. Kudos, ladies! Grace, Pavel and Fiona Harvey for “Veggie Man,” which I thought was especially appropriate as we prepare to enter the Great Fast of Lent next week. The carrot mouth was nice, but the cucumber eyes reminded me of a nice day at the spa. Ahhhhh. Congratulations, Harvey kids! I am pleased to announce your prize: NO SCHOOL TOMORROW! 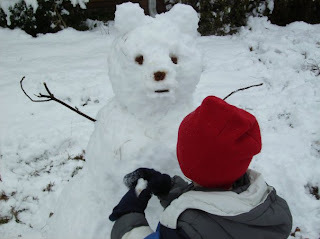 their creation of “Snow Bear.” David said Sawyer was freezing while building Snow Bear, and they exchanged appropriate growls: “Brrrrrr!” and “Grrrrrr!” I think the facial features are amazingly realistic. I would definitely run the other way if I saw Snow Bear in my yard. Way to go, David and Sawyer! 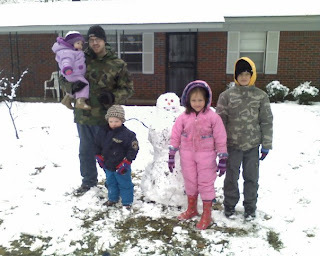 Joe White and his kids, Zachary, Bethany, Eliljah and Elisabeth have also earned an Honorable mention with their family effort. Affectionately named “Mr. White,” he is a nice addition to a happy family at play on a snowy day. I can almost hear the theme song from “Leave It to Beaver” playing in the background. Congratulations, Whites! 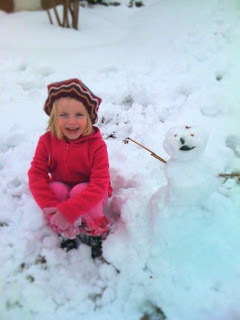 snowman in the contest, is Maggie Turner and her precious little Snow Friend. I was especially delighted to see Maggie’s snow friend’s SMILE, which is no match for Maggie’s, but she gets an “E” for effort! 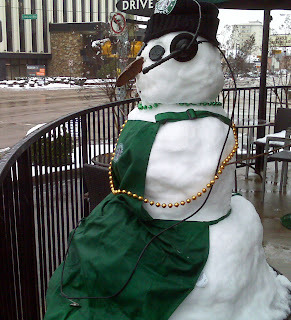 On my way to Schnuck’s this morning, I stopped for a Latte at the Starbucks on Union and caught this Starbucks Snow Person on their patio, drive-through headset and all. Love the Mardi Gras beads. Good job, midtown barristas! 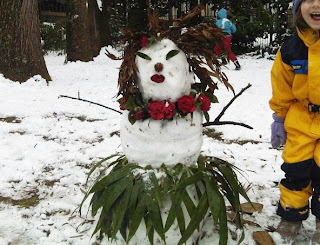 Okay, that’s the end of my Snowman Contest. 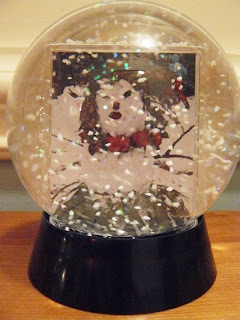 I’ll be delivering the Snow Globe and certificates to the winners this weekend, but remember, everyone who plays in the snow is a winner! 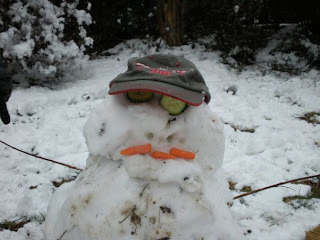 Enjoy another snow day tomorrow, and thanks to everyone for participating! P.S.S. just received this terrific snowman collage from Ethan Van drimmelen. 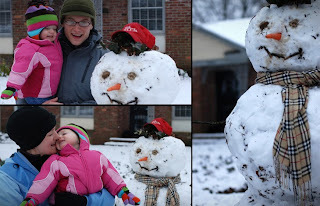 Sorry it didn’t make it in time for the contest, but you gotta love Zoe and her snowman!